Mumbai April 17 (IANS) Umesh Shukla created a special street to shoot Amitabh Bachchan s "Badumbaaa" for "102 Not Out". The director says the song reflects the spirit of the film. "Badumbaaa" features Big B along with actor Rishi Kapoor. The fun and peppy number was shot on a reel location -- a special street which was created on a set in Mumbai. "We wanted to create a lively set for Badumbaaa . This song reflects the spirit of the film and their characters. So we wanted to aim at creating a youthful and a vibrant atmosphere for this vivacious song " Shukla said in a statement to IANS. 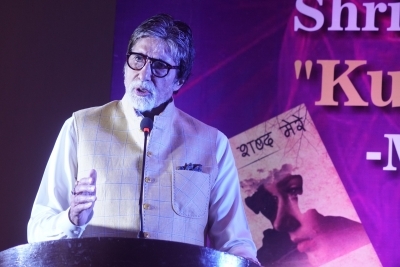 "102 Not Out" will portray the relationship between a 102-year-old father essayed by Big B and his 75-year-old son played by Rishi on the silver screen. Produced by Sony Pictures Entertainment Films India Treetop Entertainment and Shukla s Benchmark Pictures the film is slated to release worldwide on May 4. The film is about a centenarian who wants to break the world record of being the oldest man alive which is held by a 118-year-old Chinese man. He plans to do it by putting his son in an old age home.